We've all probably seen the numerous model shots of Gulf style abayas and shaylas, but here's a taster of what (real) stylish ladies are wearing in the Emirates now. Any favourites? What's the point of a long abayah when your hair is showing? they seem to wear lots of black.. 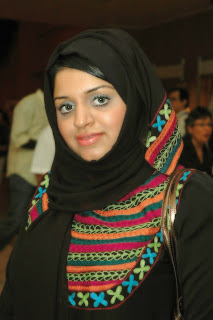 I don't think women in the gulf can wear colours other than black (out in public anyways), can they? I'd sure want to be wearing a lighter colour! My favorite is the fourth. I love the blousson type sleeves. When I was in Dubai I couldn't believe it. Sure most everyone was wearing black, but it was all so beautiful and varied. Never have I seen so much black! That was so stylish. In Saudi, it's just a lot of black, but very plain. 3rd one, very nice colorful embroidery. I want each one! salam, the pictures are nice, very fashion forward. I am stopping over in dubai for 2days only for abaya shopping, can anyone please name some good malls where I can shop for abayas and hijab in a short period? It will be a great help. The BOTTOM left is absolutely GORGEAOUS. I love the waist!!! Where can I find one of those? I loove the first one ..the sister with the cream bag- love the way she done her scarf!!! Does anyone know how she done it? Yeah I would also know how the sister with cream scarf did it! It looks really beautiful! i like the bottom left.. the waist degign is really great.. do anyone know how to wrap hijab in gulf style?